Flood warnings have been issued for Tuesday and Wednesday as winds and rains may cause tidal levels to rise. Update - August 12, 2014 - The NWS has expanded flood warnings as periods of heavy rain are likely to occur overnight between Tuesday and Wednesday. A Coastal Flood Advisory has been put into effect from 11 PM to 3 AM for Glen Cove and Kings Point, and minor coastal flooding may occur around high tide this afternoon between 12 PM and 2 PM. The Coastal Flood Advisory for the Rockaway and Freeport area has been extended and will last from 9 PM tonight until 1 AM. NOAA has also issued a Flash Flood Watch for Long Island that will last from late Tuesday night into Wednesday afternoon. Rainfall amounts of 1.5-3 inches are expected across the Island with a possibility of up to 4 inches in isolated areas. Periods of heavy rain could bring rates of 1-2 inches per hour. Original Story - August 11, 2014 - The National Weather Service has issued a Hazardous Weather Outlook and Coastal Flood Statement for the Long Island region as heavy rain is possible over the next couple days. According to the National Oceanic and Atmospheric Administration minor coastal flooding may occur around the South Shore bays in and around Nassau County tonight—namely in the Jamaica Bay, Freeport Gauge, Rockaway and East Rockaway Inlets, and Point Lookout. The Coastal Flood Advisory for this region will be in effect for the hours surrounding the evening high tide, from 8 PM to 11 PM. Tidal departures could reach between half and a full foot above astronomical tides, and flooding of more vulnerable shore roads and basements may occur. A Coastal Flood Statement has also been issued from 11 PM to 2 AM tonight for Northwestern Suffolk and Northern Nassau, where isolated minor flooding could occur around high tide and midnight as tidal departures reach half a foot above astronomical tides. Flooding may occur at a few of the lowest lying and most vulnerable areas along the shore. Minor coastal flooding will be more likely during Tuesday night’s high tide as a rainstorm approaches. There is a potential for between 1.5 and 5 inches of rain to fall between Tuesday and Wednesday, exacerbating the effects of high tide and onshore winds, as well as causing a chance for flash flooding across Long Island. As of Monday morning, the NWS was predicting a 40% chance of rain with a possibility of thunderstorms during the day on Tuesday, growing to an 80% chance of precipitation overnight and continuing into Wednesday. 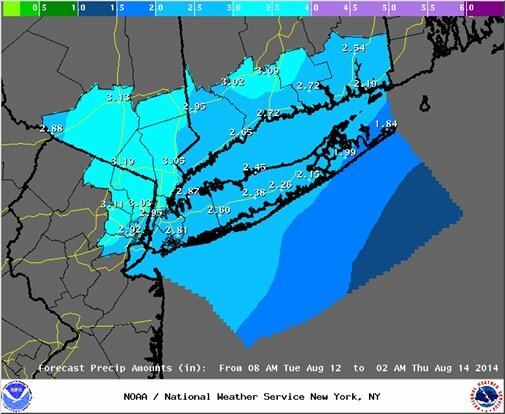 For the most up-to-date forecast information, visit the Long Island Weather Center. PSEG Long Island: How Will LI's New Power Co. Fare During the 1st Storm of 2014? Subject: LongIsland.com - Your Name sent you Article details of "Update: Flood Warnings Expanded as Rain and Thunder Approach Long Island"